1. GET A QUOTE: Send us the size of the headboard you would like us to custom make. A picture of something similar would be very helpful – you can use our Quote Form or email directly at albert@bettertex.com – we usually answer the same day! A picture of the area would also help! 3. DELIVERY: If requested we can provide white glove delivery and installation anywhere in NYC. Bettertex Interiros has been building custom upholstered furniture for over 15 years. At first Bettertex were strictly re-upholsterers although after much demand from trade specialists, Bettertex is proud to offer all custom upholstered furniture; we turn a simple drawing into a beautiful reality. Quality and Service have always been the definition of our company. We work closely with professional designers and architects to produce the products they choose and to deliver the order in the time frame that they require for their businesses! Bettertex Interiors specializes in Custom Headboards of ANY size. 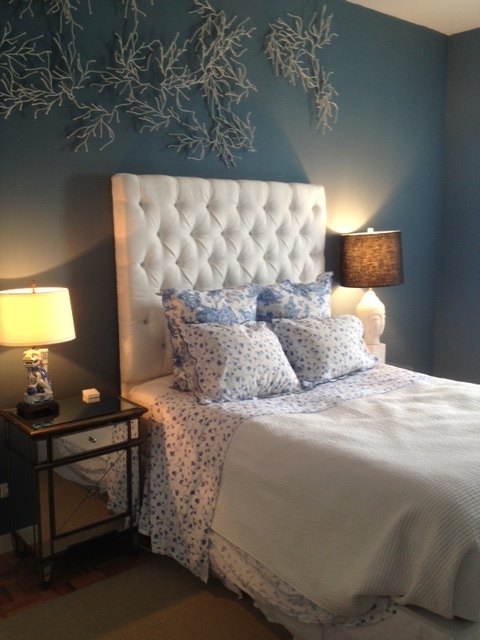 We have created upholstered beds and headboards from scratch for some of the top designers in NYC. We are always welcome to new and unique design challenges. We understand that design is more of an evolution. Whether it’s a modification of a previous design or a design from scratch, Bettertex can custom fabricate the ideal furniture design for your next project. Everything Bettertex Interiors manufactures is custom made to order – "client-specific" furniture designs – handcrafted the old fashion way with quality materials and fine workmanship. For a Free quote please fill out our Free Estimate Request Form or contact us directly at 212.431.3373. Please visit our Headboard Gallery for samples of our work.